A cooking exhaust system consists of the hood, the ducting and the exhaust fan. The ducting can be vertical or a combination of vertical and horizontal depending on where the kitchen is located in the building. According to NFPA #96 guidelines the entire system is to be cleaned to bare metal. What affects the price is that company A may only clean the hood and Company B is cleaning the entire kitchen exhaust system from hood to fan. The facility mentioned at the beginning has their hood systems cleaned every three months. When I did my inspection prior to giving the bid I found grease buildup 2 inches thick in the vertical and horizontal sections of the ducting. Thus validating our pricing. Whether the contractor they had wasn’t properly trained or didn’t have the proper tools, the fact was the exhaust systems were not being cleaned properly. Just as your restaurant carries liability and workers comp insurance and if you have delivery auto liability insurance to protect yourself and your customers the hood cleaning company should carry the same insurances to protect you. What affects the price could be that Company A has little or no insurance and Company B carries the proper insurance. Again in the facility mentioned in the beginning called us in to give a bid because the current company they had was found not having the required insurances needed to work at their site. Thus again validating our pricing. To clean an exhaust hood system to NFPA #96 guidelines will require the hood to be pressure washed. Pressure washing a hood system creates a lot of waste water. The question is where does it go. In most areas it is illegal to let the water go down a storm drain. It is also illegal to put it down a non-grease trapped drain without filtering and treating the water. This process requires a hood cleaning company to have the equipment and a procedure in place for their crews to properly handle the waste water, thus an added cost. Company A does not have this and Company B does. Therefore affecting the prices charged by the two companies. In the Northern California area where we operate the water quality agencies will hold the “generator” of the waste responsible for its proper disposal whether they dispose of it themselves or hire someone else to do it. In other words the agencies will fine your restaurant or facility and not the hood cleaning company for improper grease waste disposal. 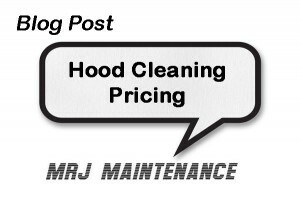 All you want to do is get your cooking exhaust hoods cleaned and for the best price possible. But before you hire a hood cleaning company consider the items discussed and ask the hood cleaner about them. Get in writing what they are going to clean. Ask for proof of insurance. Ask about their handling of the waste water. If the company you hire doesn’t clean your complete exhaust system properly YOU are at risk of a fire. If they don’t have the proper insurances YOU are at risk. If they don’t have a waste water plan YOU are at risk. If you have any hood cleaning needs in the Sacramento, Northern California area or have any questions regarding this article please feel free to Contact Us. This entry was posted in Hood Cleaning and tagged Commercial Hood Cleaning, Exhaust Hood Cleaning, Grease Exhaust Cleaning, Hood Cleaning Pricing, Restaurant Hood Cleaning by mrjmaint. Bookmark the permalink.